When, I first planned this book, I thought that democratic caring would be the highlight of this book, considering that my intellectual work deals with democratic education. My concern is always what other forms caring could assume if democratic caring already integrates multiple notions of caring, as discussed throughout this book. 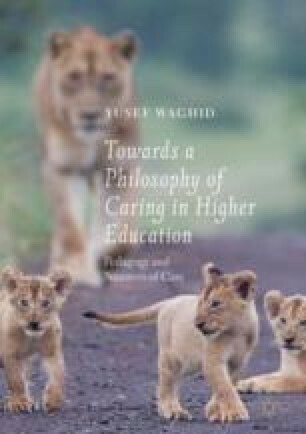 Only when I read Michael Slote’s work on caring did I realise that democratic caring might not be an overarching enough term for notions of care that deal with virtues of compassion, forgiveness and reconciliation – aspects of educational inquiry that feature prominently in my writings on educational justice. Thus, in this chapter, I draw on the seminal work of Michael Slote (2007) to elucidate a notion of empathic caring. I argue that such a notion of caring is commensurate with an enactment of respect and dignity towards others. Likewise, I show how respect and dignity as manifestations of empathic care could influence pedagogical encounters positively. Then, I look at the notion of justice and how empathic care could enhance just pedagogical relationships through an emphasis on constraining injurious speech.